Our next Hawkeye medalist is Frank Cuhel, a speedy hurdler who raced to fame in 1928. Frank Cuhel was born in Cedar Rapids in 1904. He was a track star at Cedar Rapids Washington High School, setting a high school national record in 1924 in the 220-yard low hurdles at a meet held at Iowa Field. The highly touted prep star decided to keep running at Iowa Field by joining the Hawkeyes after graduation. He began his eligibility as a sophomore in 1926, and he participated in football and track. Cuhel actually lettered for the Hawkeye football team twice, in 1926 and 1927. But his real fame came on the track. 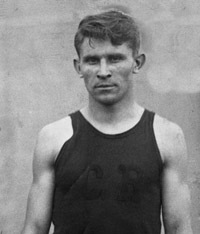 Cuhel made an immediate impact as a sophomore in 1926, finishing sixth in the 220-yard low hurdles at the NCAA championships. He improved upon that finish as a junior, placing second in the national championship meet in both the 220-yard low hurdles and the 120-yard high hurdles. By his senior season, Cuhel had reached his athletic peak. In June 1928, he went to the national championship meet at Soldier Field in Chicago. Not only did Cuhel win the NCAA championship in the 220-yard low hurdles, he had an NCAA record time in the event. That same month, he beat the world record time in the 400-meter low hurdles during a practice run, which gave him confidence going into the 1928 Olympics. Frank Cuhel faced a real challenge at the 1928 Olympic Games. At the USA National Trials, he qualified for the Olympics by running the 400-meter hurdles in 52.1 seconds, which was better than the world record at the time. Unfortunately for Cuhel, it was only good enough for second place at the meet. Frederick Morgan Taylor bested both the world record and Cuhel at the National Trials, finishing in 52.0 seconds. Cuhel and Taylor both went to Amsterdam for the 1928 Olympics, and Taylor was a heavy favorite in the 400-meter low hurdles. Taylor was the defending champion in the event, having won gold at the 1924 Olympics in Paris. Another runner to watch was Great Britain’s David Lord Burghley. As a college student, Burghley’s fame spread across the UK after he sprinted around the Great Court at Trinity College within the time it took the campus clock to strike 12 o’clock. His feat became such a legend that it inspired a similar scene in the movie Chariots of Fire. In the 400-meter low hurdles final at the 1928 Olympics, Burghley pulled the upset, outrunning the heavily favored Morgan Taylor for the gold medal. Finishing just 0.2 seconds behind, and just ahead of fellow countryman Taylor, was Frank Cuhel, securing the silver medal for the USA. Cuhel became so popular in the Netherlands after his silver medal performance that he was hired by several Dutch firms to serve as a business envoy overseeing their exports to the United States. His business ventures eventually led him to Java, where he later joined Mutual Broadcasting Systems to serve as a war correspondent when World War II broke out. Cuhel relayed radio reports of actions or other newsworthy items back to the United States. He soon had to flee Java, escaping the Japanese invasion there by mere hours. In 1943, he was being transferred from the Pacific to the North African war zone, where he could continue his war correspondence. Tragically, his plane, the “Yankee Clipper”, crashed into the Tagus River just outside Lisbon, Portugal, on February 22, 1943. Although there were 15 survivors (including actress Jane Froman), twenty-four passengers were killed. One of those 24 fatalities was Cuhel, whose body was found three weeks later. Frank Cuhel was 38 years old. Fifty years after his death, Cuhel was inducted into the University of Iowa Hall of Fame. It’s a worthy tribute for a man who brought so much pride to Iowa in 1928.